Last month Rev. Melissa delivered a sermon reflecting on the terrible journeys of the many unaccompanied immigrant children coming into the United States from Central America and Mexico. She talked about her fear that they will face deportation even though the UN reports that many likely qualify for refugee status. 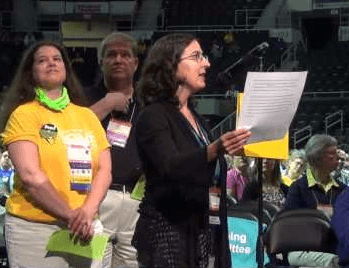 After that sermon, Dan Flippo suggested to her that her concern might warrant proposing an Action of Immediate Witness (AIW) at the Unitarian Universalist Association General Assembly, held in Providence, RI last month. The UUA Commission on Social Witness (CSW) describes an Action of Immediate Witness as a statement “that expresses the conscience and carries the authority of the delegates at the General Assembly at which it is passed.” Rev. Melissa followed up on the suggestion by writing to several immigration justice leaders in the UUA to ask their advice. She was encouraged to propose an AIW calling people to an upcoming event in Washington DC focused on asking President Obama to stop the deportations. With help from Dan Flippo, several colleagues and lay leaders as well from members of the Commission on Social Witness (including former UUCK member Susan Goekler who is chair of the CSW,) Rev. Melissa proposed an AIW which was accepted and ultimately endorsed by the General Assembly. Dan took video of her presenting a statement in support of the AIW which he posted to our congregation’s Facebook page if you are interested in learning more. Rev. Melissa will be going to Washington, DC to participate in the Pray for Relief Faith Summit on Stopping Deportations at the end of the month. We hope you enjoy this wonderful video created by Rev. Renee Ruchotzke featuring photos by Brad Bolton and music by Hal Walker. Check out the UU Church of Kent Stewardship Campaign video created by David Smeltzer.